Anyway, lots of CI teachers are using telenovelas in class as another way of providing rich and compelling comprehensible input to their little darlings. Let me clarify! The telenovela itself will NOT be comprehensible to your students…but everything you do with it will be: you’ll talk about it, recap the drama, make predictions, lead discussions, ask questions, describe characters, and on and on and on….there’s just so much you can do with a telenovela in class! By the time my little darlings reach Spanish 4, most of them have had 2-3 years of CI teaching. They’ve created ridiculous stories with zany characters, done a zillion movie talks, PQAed themselves silly and they’re ready for something new. A telenovela makes language class seem fresh and now…and there are plenty to choose from! There are a handful of telenovelas that Spanish teachers use in class. For us the answer was Gran Hotel. It’s an authentic resource! They’re listening to real Spaniards speak real Spanish…this gringa here can only do the best she can with the accent she has! It’s super compelling. I’m not even kidding, my kiddos are on the edge of their seats. They beg to watch a few more minutes when I pause it. I love the gasp of disbelief when secrets are revealed. Or the spontaneous cheers when (spoiler alert!) Julio and Alicia finally kiss! I really like the show. All of the drama makes me excited to come to Spanish to see what happens next. PLEASE CONTINUE IT! The drama and the story plot is so good! And it makes my life appear to have less drama, which is healthy for me. Spanish 4 is growing and I think it’s because the word is out! This year I’m teaching 3 sections of Spanish 4, the most sections we’ve ever offered at my school! At the beginning of the year, when I ask students why they’re taking Spanish 4: Gran Hotel was a popular response! It makes planning a breeze! Some teachers show their telenovelas on Fridays…we watch and discuss every class period. Nearly everything we do is connected to Gran Hotel- the vocab we focus on, our assessments, class conversations, textivate activities…they’re all anchored in Gran Hotel and I love the continuity and ease of planning. And they love the drama and suspense! Win-win! Know your school. Know your community. Choose wisely. Some teachers love teaching El internado… I watched a few episodes and thought No way, José! There’s no way I’m showing that to my little darlings! For us, Gran Hotel was the mellower option…but I’m sure there are lots of choices to provide compelling (and appropriate!) content. Here’s Señora Jota Jota’s reflections on using Internado in class…and why she changed her mind! Also, think about the maturity level of your students, I’ve got Juniors and Seniors in my Spanish 4 class. Cover your bases! After I decided to peruse Gran Hotel, our district has quite a lengthy process to get approval to show commercially made videos. Here’s my petition to use Gran Hotel, including sample lesson plans, how it supports Nevada’s World Language Standards and “objectionable material”. I also sent home a parent letter and permission slip, just to be safe. As I told my administrator: I love Gran Hotel, but I love my job more. 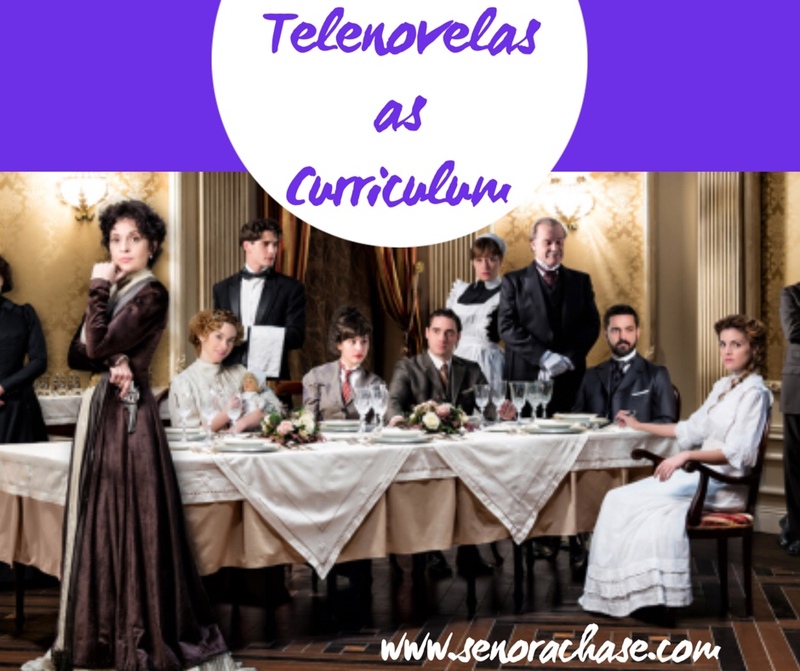 There used to be a lot of great resources on Teachers Pay Teachers for telenovelas…until Edunovela got the great idea to use telenovelas as curriculum, bought the rights for all Atresmedia shows and made teachers remove their materials from TPT. Soooooo (I’m not bitter at all!)….. You can buy Edunovela’s materials or write your own. If I were starting from scratch, I’d do a little Write and Discuss after watching each segment and have students re-read those summaries before Episode tests. Since GH is on Netflix now, we had “The Talk” at the beginning of the year. “The Talk” goes like this….You could go home and binge watch Gran Hotel this weekend BUT DON’T because 1) the rest of Spanish 4 will be boring for you 2) you’ll have a hard time participating in class discussions and you’re going to get confused on your tests and 3) I’ll be mad at you forever if you spoil the fun for the rest of us! There are plenty of other AWESOME telenovelas on Netflix for your binge-watching-pleasure, so find another one! A few don’t listen to me, and guess what….#1 and #2 come true. (But not #3, I’m not mad at them…because, come on! They’re watching Spanish at home!) But I’m secretly hoping Gran Hotel leaves Netflix again for good so I can monopolize all the GH drama! I’d love to hear how you use telenovelas in class and which ones!! One of these days I’ll be ready for something new! Next The life-changing, no stress, no grading, no sweat way to assign speaking, listening and reading grades. Question for you…do you show it with the English or Spanish subtitles? I never know what to do in regards to subtitles. I show it with Spanish subtitles and pause frequently to have them chorally translate when it’s a section they can understand. If not, I pause and summarize in Comprehensible Spanish what happened. Empece usar las telenovelas en mi clase. I teach ELL and one of my students from Mexico is like… Miss- why don’t you…and I thought… gee- why not? So I showed it to my regular high school Spanish 1s (Soy tu dueña…super racy…I know…but we have occasional ‘technical difficulties’- it has super-basic family situations, restaurant, clothing, places around town, jobs)- these were my ‘tough cookie’ kids- the ones who were on probation for assault, robbery, drugs, and who were in and out of Alternative Academy. They would skip school and were chronically absent. I honestly didn’t have anything to lose… OMG- I even had kids signing in late (instead of just missing) just so they wouldn’t miss my class. They were hooked at the first cachetada. I do have English subtitles for my 1’s and 2’s- we use it to expand vocabulario. We talk about ‘tú’ and ‘usted’ and when you should kiss vs. shake hands and which words will get you slapped. We don’t get to finish this telenovela in Spanish 1 (we usually start at the end of the semester- students have to prove they understand enough Spanish to watch) and we watch “Mañana es para siempre” in Spanish 2 (more dialog and advanced vocabulary and grammar- but the same actors…which my kids LOVE). Yay! Oh… my heritage language learners LOVE IT!!! I include standards on the watching guides. We talk about literary elements (plot, main characters, foreshadowing, character development, allusions, archetypes…) and in REAL SPANISH. PD: I use the abridged versions… so read reviews to see which ones work for you…and ALWAYS preview…these are NOT for subs! Yes!!!! I love this so much! Hook those kiddos! Me encanta. Voy a compartir esta idea con mi colega quie’n ensen~a nivel 4.